From swampland, to Indian settlement, to refuge for westward-bound European settlers, to bustling urban center, Washington has had a long and colorful history. It's played host to countless heads of states and powerful politicos as well as being home for its residents, a workday destination for thousands of commuters, and a must-visit site for scores of domestic and international tourists. About 15 million visitors annually wander the beckoning green lawns of the National Mall, tour the city's museums and monuments, enjoy headline-making festivals, and eat at one or many of the metro area's numerous top-flight restaurants. Its transition from sleepy Southern town to a power magnet would probably puzzle the city's founding fathers, who allegedly fled Washington in its soggy summer heat for cooler climes. In fact, Washington as the nation's capital almost didn't occur: The rivalry over where the presidential city would eventually locate was fierce, and only a congressional decree in the late 1700s secured the District's place in American history. Today to its many inhabitants and commuters, the city is usually just referred to casually as "The District" or "DC," despite its history and its importance as the nation's capital. Designed in part by French architect and urban planner Pierre L'Enfant after it officially became the capital, the city is laid out on a complex grid with both lettered, numbered and named streets that frequently converge and crisscross in one of the city's many traffic circles. Though the layout may prove baffling at first, its underlying logic allows for easy transition from business areas and government centers to local neighborhoods. Even so, newcomers to the District may find a tour bus ride through the city's numerous areas — from its resplendent National Mall lined by museums and filled with monuments to Capitol Hill and the Library of Congress to the charmingly Southern Georgetown with its old-fashioned town homes and bustling shopping streets — a helpful way to find their bearings and to pinpoint where they'd like to spend time sightseeing, eating and shopping. But for tourists with minimal time to spend, a street map of DC's highlights helps guide them to get the most out of their stay, regardless of where their hotel is located. So welcome to America's proud capital city. With its many appealing activities and sights you'll plan to return often. There are numerous hotels in the District, from the ultra-chic and expensive, such as the two The Ritz-Carltons (The Ritz-Carlton, Georgetown and The Ritz-Carlton, Pentagon City ), the Mandarin Oriental, Washington DC, The Willard, and Four Seasons Hotel Washington DC, to fun and funky like The Tabard Inn. If you want, you can also opt to stay outside the District in Alexandria's quaint Old Town area at the Morrison House or directly across the Potomac River in Hotel Palomar Arlington. In either case, that means a taxi ride or taking public transportation to get down into the thick of things. You may even find a boat ride across the Potomac to the area's newest and biggest tourist and convention center, the National Harbor, with its galaxy of hotels such as the immense Gaylord National, restaurants, shops, and entertainment sites, a worthy way to spend a few hours — or a fine place to stay for your capital visit. Staying away from the District, however, means a taxi ride or public transportation to get back downtown into the thick of things. Breakfast early in your hotel, for you've got a long day ahead. Tie on your walking shoes, grab your camera and map, and by cab or on foot, head to the United States Capitol on Capitol Hill, the country's seat of power, where if Congress is in session, you may spot your favorite lawmaker. Allow ample time to stroll around the outside of the majestic building, admiring the dome and surrounding grounds. To visit inside, sign up for a guided tour, the only way the public can enter the building post 9/11. Tickets are free and available on a first-come, first-served basis at the Capitol Guide Service kiosk on the premises. Afterwards, walk along Independence Avenue behind the Capitol towards the Library of Congress, which holds the nation's largest collection of books and is a major research center. Visitors are welcome to stroll through its various exhibits, and the best place to start is in the Orientation Gallery on the Jefferson Building. If you are keen on research, you may apply for a pass first in the Madison Building, and this will allow entry to the Library's various research and reading rooms. Later, take a turn through the winding streets behind the library. Or walk a short way down towards the Washington Monument for a peek at the U. S. Botanic Gardens, an historic building that displays exotic plants. By this time, you have probably built up quite an appetite, so consider indulging yourself in some of DC's finest eats, right there on Capitol Hill. Walking up Pennsylvania Ave. past the Library of Congress, you'll spot several tempting stops: famous foodie Spike Mendelson of Top Chef fame has two eateries next door to each other: Good Stuff Eatery for burgers and shakes and We, the Pizza, both guaranteed to feed the hungry soul. But if you are looking for more choices, continue up Pennsylvania to 8th St., and turn right onto Barracks Row, where you can pause for homey comfort food at Ted's Bulletin, or more exotic fare along the way. For the afternoon, head back down to the Mall. From there, take a short stroll through winding streets over to Union Station, the hub of the city's railroad travel business. Located on Massachusetts Avenue, NE, Union Station is also an historic site completed in 1908 as a fine example of the Beaux-Arts style of architecture. Not only has it served as a passage to and from Washington, it has also become a popular shopping destination with stores that feature everything from books and CDs to lingerie, women's wear, shoes and toys. It also houses several casual and fine-dining restaurants. Rested up? Stroll back from Union Station towards the National Mall and Memorial Parks, about 1 mile away between Constitution and Independence Avenues. On the way, stop for lunch at Charlie Palmer Steak, Art and Soul or Bistro Bis, popular places for glimpsing celebrities and politicos. Dominating the city's landscape, the Mall is flanked by the city's major museums and at mid-section at 15th Street and Constitution Avenue it features the famous landmark, the Washington Monument, a dizzying 555-foot high spire with an observation tower at its peak. 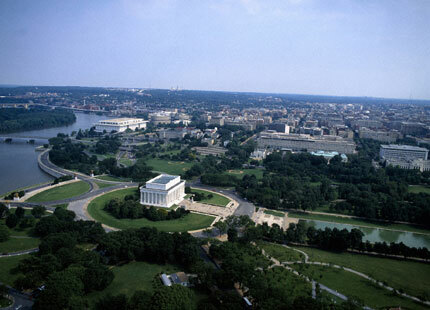 From that vantage point, take in the dazzling 360-degree view of Washington and its metro area. The Washington Monument is open daily and is accessible with timed free tickets. Advanced tickets are available through the National Park Service Reservation System. Exiting the monument, walk west towards its farthest end along the lawn and past the National Mall Reflecting Pools towards the Lincoln Memorial. As you stroll along, be sure to look towards the right to get a glimpse of the White House with its white columns gleaming in the sun. Further on, pause at the Lincoln Memorial Reflecting Pool, where on clear days you can see reflections of the Washington Monument cast onto the surface of the water. The majestic Lincoln Memorial, an impressive Greek-style monument to the country's 16th president, is always a tourist favorite: Under its portico, a massive marble statue of a seated Lincoln looks out over the Mall in silent meditation. On the side chambers, visitors can read carved inscriptions of Lincoln's Gettysburg Address and one of his inaugural speeches. Facing back towards the Mall and Capitol Hill, veer left along the pathway to the Vietnam Veterans Memorial in Constitution Gardens. Situated partially below ground level and perhaps one of the most-visited sites in the capital, the Memorial is separated into three different sections: the Three Soldiers statue, the Vietnam Women's Memorial and the Vietnam Veterans Memorial Wall, where the names of all the combatants are inscribed. On any given day, friends and relatives of a fallen soldier stand in silent prayer in front of their loved one's name. 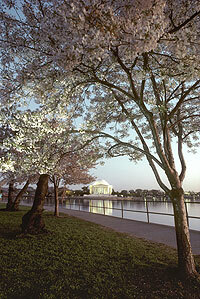 The last stop of the day lies on the southern perimeter of the Mall, where in an easy stroll you'll see the imposing circular domed Thomas Jefferson Memorial fronted by its famed Tidal Basin, where many a tourist pauses to enjoy its cherry blossom trees when in spring bloom. At the western edge of the Tidal Basin is the sprawling Franklin Delano Roosevelt Memorial. In a series of outdoor spaces, the memorial traces the 12-year presidency of FDR during one of the country's most tumultuous times. At day's end, take a breather before heading over to Georgetown. Plan on having dinner at the popular Clyde's of Georgetown, always abuzz with fun-makers. Centrally located on M Street, NW, the restaurant is a convenient point for wandering this old and charming part of the city. For a quieter meal, consider going to Washington Harbour with its fine waterfront views of the Potomac River, and eat a farm-centric meal at Farmers & Fishers.